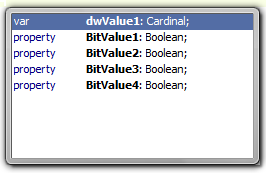 Code completion shows that the record has one DWORD Value and 4 Boolean Values which is just what we want! constructor _BITFIELDSTRUCTURE.Create; // Did you know that Delphi permits leaving out (const dummy: word) here? // which size was passed to us we cast to 256 bits. // is the bit set? Struct.BitFields := [OtherValue, ColorDepth1, ColorDepth3]; WriteLn(Format('Value=%d', [ValueFromBitSet(Struct.BitFields, Integer(ColorDepth1), 3)])); end. A Delphi Set can contain at most 256 values. The ValueFromBitSet function returns an Int64, so values that do not fit in an Int64 cannot be returned. Values in a Set need a unique name. 5 Responses for "Working with bitfields in Delphi"
Using sets is certainly a good solution (it does result in quite optimal code-generation, especially when you only need to handle single-bit values. However, I don’t like the fact that using the values suddenly becomes a somewhat weird set-operation – I would rather approach them as properties.